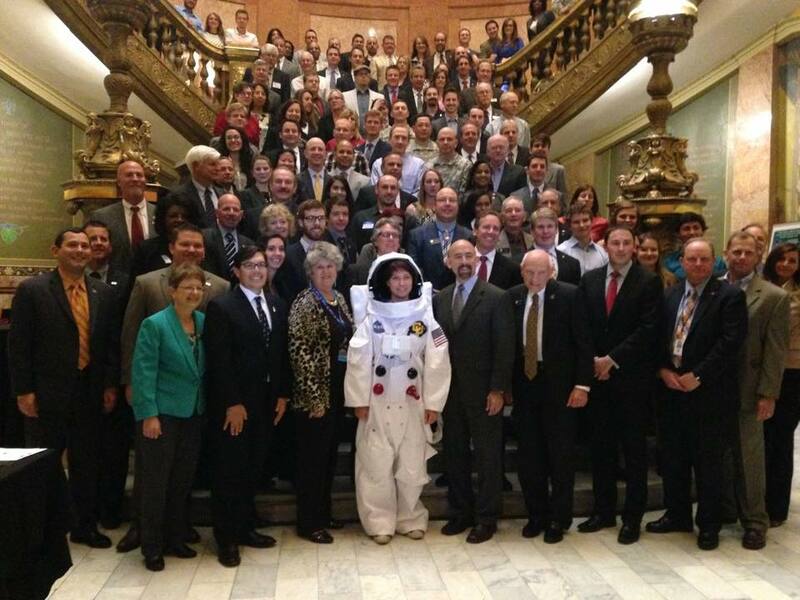 March 24, 2015 – The Colorado Capitol building was the epicenter for space exploration on Monday as the state’s industry leaders and lawmakers gathered to discuss the impact of the expanding aerospace industry and the important role played by Colorado, where some of the world’s most advanced crewed and uncrewed space and satellite systems are built. Participants enjoyed a full day of exhibits and interactions with industry representatives and elected officials, including Lt. Gov. Garcia. Senate Joint Resolution 15-019, concerning the designation of March 23, 2015 as Colorado Aerospace Day, was presented and unanimously passed. The resolution acknowledges the contributions that Colorado aerospace companies, organizations, and universities have made to scientific discovery, technological innovation, and in securing the economic and national security of the nation. Colorado is a strategic location for national space activity, with four key military commands – the United States Air Force Space Command, the United States Army’s 1st Space Brigade, the United States Northern Command (USNORTHCOM) and the North American Aerospace Defense (NORAD) – and three space-related United States Air Force bases – Buckley, Peterson and Schriever. Colorado is also home to the nation’s top aerospace companies, including Ball Aerospace, Boeing, Exelis, Lockheed Martin Space Systems, Northrop Grumman, Raytheon, Sierra Nevada Corporation and United Launch Alliance, with close to 500 other space-related companies providing aerospace products and services including launch vehicles, satellites, components, software, sensors and navigation equipment. In 2014, Colorado ranked first in the U.S. for private aerospace employment, and direct and indirect aerospace employment exceeded 160,000 workers in high wage jobs, with a payroll of close to $3.2 billion. Colorado companies made significant contributions to the Orion program, including Littleton-based Lockheed Martin’s role in the design and engineering of the spacecraft as well as in its components and heat shield creation; Broomfield-based Ball Aerospace’s role in its flight camera development; and Centennial-based United Launch Alliance’s launch of the Delta IV Heavy Rocket for its historic unmanned Exploration Flight Test 1, known as EFT-1, on December 5, 2014. EFT-1 was the first human-rated spacecraft flight in over 40 years to go beyond low-Earth orbit. It took Orion to an altitude of 3,600 miles above the Earth’s surface, more than 15 times farther than the International Space Station. In the future, Orion will carry humans on exploration missions to an asteroid and eventually Mars. Colorado offers these aerospace companies the country’s second-most highly educated workforce and Colorado’s universities, including the University of Colorado at Boulder (CU-Boulder), University of Colorado at Colorado Springs, Colorado School of Mines, Colorado State University, University of Denver, and Colorado Mesa University, are among the world’s best for aerospace-related degrees. CU-Boulder is the number one NASA-funded public university in the United States, with over a dozen aerospace-related academic units and a variety of related programs on campus that support the aerospace industry, the business of aerospace, space science and research, the application of aerospace technology, and research in solving earth-bound challenges. CU-Boulder counts among its legacy 18 astronauts. CU-Boulder is also home to the Laboratory for Atmospheric and Space Physics, which is the only research institute in the world to send missions to all eight planets and Pluto. Last September, LASP made international headlines when the Mars Atmosphere and Volatile Evolution (MAVEN) spacecraft was inserted into orbit around the Red Planet. MAVEN’s principal investigator, Bruce Jakosky, is based at CU/LASP and the university provided science instruments and leads science operations for the mission. The mission, which is designed to study the upper atmosphere of Mars and how it interacts with the sun and the solar wind, was praised as a “Colorado mission.” Lockheed Martin built the spacecraft and is responsible for mission operations. The MAVEN spacecraft was launched on a ULA Atlas V rocket. Another notable mission will put Colorado back in the spotlight this summer. After a decade-long voyage through the solar system, NASA’s New Horizons mission is scheduled to fly by Pluto, with its closest approach in July 2015. The principal investigator for the New Horizons mission is Alan Stern of the Southwest Research Institute (SwRI) in Boulder, a CU-Boulder alumnus. SwRI leads the science team, payload operations and encounter science planning. New Horizons is carrying the LASP-built Student Dust Counter (SDC). SDC is the first student-built instrument ever to fly on a NASA planetary mission and holds the record for the most distant, functioning dust detector ever flown in space. The spacecraft was also launched on a ULA Atlas V.
Colorado Aerospace Day was co-hosted by the Colorado Space Business Roundtable (CSBR), the Colorado Space Coalition (CSC), and Citizens for Space Exploration. Sponsors included Aurora Chamber, Ball Aerospace & Technologies Corp., Boeing, Colorado Competitive Council, Durango Mountain Resort, High Impact Creative, Lockheed Martin Space Systems, Metro State University, Sierra Nevada Corporation and United Launch Alliance.